As soon as I saw this photo, I imagined the picture (embroidery?) on the wall singing "Hello, Dolly," and now I can't get that image out of my mind. The listing, intriguingly, says "IMPORTANT-SEE PRIVATE REMARKS" -- I wonder if it has anything to do with that? The dishes in the sink are a nice touch. [wince] Probate + private remarks = someone died in the house. Aside from the flies, that is. "SOLD IN ITS 'AS IS, WHEREIS' CONDITION WITH NO WARRANTIES EXPRESSED OR IMPLIED"
Can you say lead paint? How about giant crack in foundation? The house was moved here? I think this time I will take it "where is" thanks. I would like to "express" an "implied" bad feeling about this house. That room appears clean, but it is the only room shown. The house itself appears to need a lot of exterior work. When I see these west coast listings, I am grateful to live in Ohio. Your prices are astronomical and if 1/4 of an acre is a HUGE lot... I think I am spoiled. 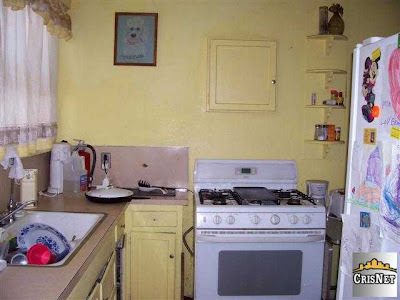 The little door above the stove must be a fire exit for those occasional grease fires that start in the kitchen.